This is a guest article of my friend Alexander about his experience living with Martin Küng’s new FET amp – so please enjoy! If you see your stereo as an equivalent to a hen house you may see your DAC, vinyl set-up, CD-player, reel tape machine or even terrestrial tuner – worthwhile listening in if you live in an area where there is still high quality broadcasting – as hens picking the corn you feed to them in form of your favorite musical or other audio tastes. And surely all of these hens are there to give you the most tasty and biggest eggs in form of the best sound you may have from your stereo. Now here we have a single ended, zero feedback FET amp capable to take control over your hens and so to get the best out of all your electric sound suppliers. Martin Küng, most discriminating designer of line stages, ultra low noise linear power supplies, power cords but also specialist gadgets like unique effect pedals for musicians always had a knack for FET amps. Martin is also convinced that for good reason FETs have advantages over valves. He craves for getting out melody, sound colors and musical flow, quality features which are typically associated with single ended triode designs out of the FETs he builds into his amp designs. Still, Martin concedes that a Class A design will deliver more of the above quality features, an opinion I clearly share from my own experience, specifically when I converted to SET amps after a long audio journey with – being a late 60s child – firstly Japanese and later on British transistor amp designs. So, you may ask yourselves why to bother with getting a FET based single ended design right, when the big advantage of thermal stability comes naturally with a directly heated SET? The simple answer is that Martin is one of the few – Nelson Pass comes to mind – who knows how to get the best single ended amplification out of FETs. Like with tubes, if you build an extensive circuitry around the power FETs to avoid the slightest distortion by all means, you are destined to get a sound, which at best, will put you to sleep when listening to your stereo. Not being afraid of harmonic distortions and keeping the circuitry as simple as possible obviously is key to success. As with tubes there is a huge number of FETs to choose from for amp design and Martin does not only know which fit best for such design, but he also engineered a simple but clever circuitry lay-out with no negative feedback and not even a single capacitor in the signal path. I first encountered Martin’s design when I spotted a new circuit print in his workshop in Vienna’s sixteenth district. Though Martin has much reason to be proud of his new designs, he never boasts about any of them. Probably, this is one of the reasons why Martin’s designs are not more widely spread. So, only when I asked him for what he is using this circuit print, he mentioned that he is building a single ended transistor amp and that he would be more than happy to borrow me this, his second prototype (the first had even less power). At that time – meanwhile more than three years ago – the device was only fixed to a wooden board. Though Martin being one of the good audio guys and a friend of mine, I suspect he didn’t borrow me the amp only out of generosity, but rather because he knows that my highly efficient Haigner Gamma horn speakers will reveal any weakness his amp may show. Back then – as still today – the amp features the option to switch between push-pull and single ended mode, the former giving more oomph and the latter a in my ears only slightly more refined sound. The change from PP- to SE-mode can be applied right during operation without causing any noise. There is also a volume attenuator, so you can use the amp directly with one dedicated source omitting a preamp. The amp offered and still offers only one stereo cinch input socket but Martin is planning to offer a two-way input selector together with a second RCA pair for future editions of the Red Rooster. As always with Martin, he told me that it will take weeks of operation for the fresh solder to settle so that the amp will come to what he said would be an acceptable quality level. As so many times before I thought that Martin is overly obsessed with different types of solder as well as massive burn-in effects he claims to result from even only re-soldering one contact point in any audio circuitry. At home I put the device on power and – despite Martin’s prediction about burn-in effects – immediately started to listen to music. And even without respecting any break-in requirements I was astounded by the musical flow and colors pouring out of the speakers. Never would I have thought that a FET design would be capable of doing so. Also stage size was realistic and well defined. However the prototype had a humming noise floor level and it also lacked bite and punch. Switching to push-pull modus operandi helped for the latter but also increased the humming. Though back then I did not believe in waiting for weeks for burn-in effects to disappear, I left the prototype in my system but other than delivering a more structured sound nothing much changed over some few weeks of operation. When I returned the amp, I gave Martin my opinion about the pros and cons of the prototype. I mentioned to him that I would be interested but only after considerably increasing its power output as well as massively improving its noise to signal ratio. Both such enhancements I thought hard to be achieved so easily. Martin agreed however that eventually he can do something, both about the hum and the lack of power. If so I asked him what his pricing ideas would be for the final product. Martin gave me a very low number and teased me to say that I would be more than happy to buy at this price. More than a year passed by during which Martin, also being an advocate for good circuitry design rather than using highly expensive parts, when assembling the official production version during which – among other improvements – all resistors got replaced by non-magnetic high end types. 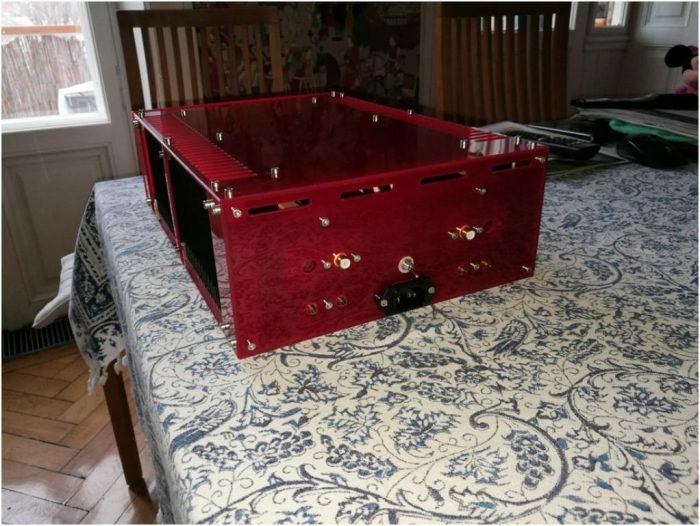 He also put the amp into a nicely designed red acrylic glass box and called me to announce that the amp was ready. Now, the hum of the prototype was gone, but was replaced with a different kind of slight noisy hum effect. Also, power output was rather less, than more, whilst the initial quality features of the prototype remained intact. Back with Martin I suggested to him that the noise may come from the transformers, at least by the sound of it. By lifting the transformers to float one and half centimeters above the circuit board Martin quickly managed to get rid of the distorting noise whilst the power problem took longer to resolve. As it finally showed calculations and design had been all correct, but the circuit board itself was faulty in as much as one resistor in each channel wasn’t connected to where it should. Aside the benefit of not having to think of often expensive replacement of matched tubes, Martin’s design also avoids a requirement for big-sized and heavy output transformers you typically find in tube-amps designs, which – if one man can lift them at all – always tend to tilt to one side (where the transformers are packed) when you have to carry them. 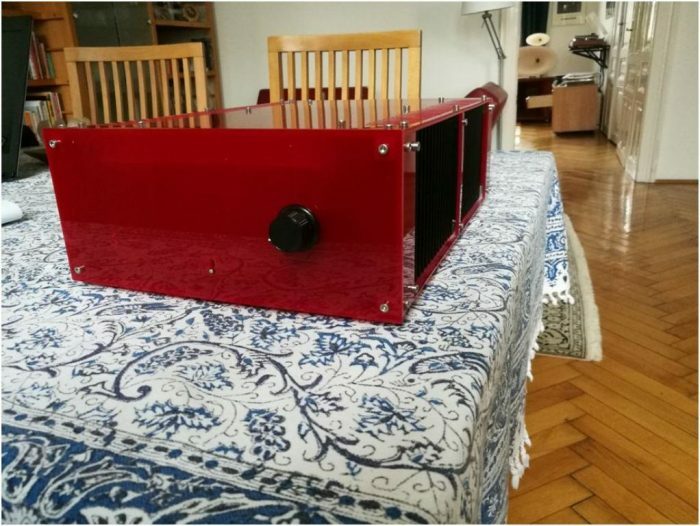 Being a boxed design in red acryl with a measurement of 25x36x11 centimeters (w/l/d; without sockets and volume knob) and a weight of merely eleven kg there is no risk to topple over and to break your tubes (well, there are none) or back when putting the amp to a different place (which was quite helpful as the prototype and later the amp itself often changed place between Martin’s workshop and my apartment). Finally, after again hooked up in my system there was the attack and strength I missed from the very beginning. Also the amp proved to be pretty silent when not receiving a signal. Playing Sade’s “Smooth Operator” as well as Dave Pike’s “Pike’s Peak” (still being reference tracks for me when doing auditions) there was – on the large scale – nothing to miss against my beloved GM 70 SET amp. When going into the details, the GM 70 SET amp still has a better airiness, a slightly quicker progress and wider extension into the higher frequencies. But only by a slight margin. Little Red Rooster, on the other end even had a tighter grip on the speakers, noticeable particularly at the lower frequency ends. Stage extension became slightly more generous in contrast to what I remember from the previous versions, stage orientation is very convincing, both at par with the GM 70 SET amp. In push-pull mode disco and classical music had more drama but even big orchestral works came with convincing authority in single ended mode. In short, I definitely had no excuse anymore to dodge payment. Meanwhile, I have Martin’s amp hooked up to the Gamma’s as much as the GM 70 SET amp, and, after months of further “break-in” I notice that Martin’s amp is much quicker at arriving at the right operations temperature (meanwhile only a matter of minutes) than at the beginning, after my purchase. Also, it seems to me that over time (difficult to assess though over such a long period) the amp, though already excelling after I got it back again after the fixing connection of the resistors, still has gained in terms of preciseness and control. Maybe I should not be so doubtful anymore about Martin’s ideas concerning quality of solder as well break-in requirements. Respighi’s Pines of Rome (Fritz Reiner conducting the Chicago Symphony Orchestra on my RCA Victor Red Seal, LSC-2436, a “Shaded Dog” 16S/16S vinyl pressing) starts at low volumes. No wonder that this record was initially included in the TAS list. Even my only VG copy serves right to locate where on the stage the musical instruments are being located, which even works when the sound level is really up there with the ghost Roman army marching by at the end of this musical masterpiece. With Martin’s amp you get the illusion of smelling the scent from the Pine trees granting some protection from the sun for the soldiers marching in the Roman summer heat. This design presents the most delicate details of the music not at the cost of the musical flow but with all sorts of colors. And even when operated in single ended mode it comes with tons of oomph with my Haigner horns. Not bad for such a little Red Rooster. And then the term “little” may also be seen as discriminating in the future as Martin told me recently that he will also offer a more powerful version of the Red Rooster with a taller enclosure. Not only sporting two inputs, but twice the oomph. With this device even lower-efficient more conventional speaker loads should not cause any trouble and I cannot wait to see and hear what this supercharged rooster will be able to do. Even without tubes I remember the saying that a tube design seems to deliver twice the nominal power. In lieu of tubes this is more than true for this beautiful pecker, …ahem rooster. Other than with the most power-consuming loudspeaker designs there is no risk anymore to put all of your eggs into this basket – what more can one ask from a sand amp?